"If the Tower of Fangs sealed this place, maybe we should just leave it be." The quest to find the mysterious demon Azalie continues in Orphen #3. As the disc begins, Orphen, Cleao, and Majic have decided to travel to a nearby,abandoned island. Only Orphen knows why he's going this route, but his companions arelosing patience. On the way there, they run into their perpetual annoyances, Volcan andDortin. As much as they'd like to rid themselves of the mischief makers, they still guardthe Sword of Baltanders, so Orphen must help them. Eventually all of them wind up insome mysterious ruins where much is revealed about who Azalie is, her relationship toOrphen, and how she turned into the savage dragon she currently is. Whereas Orphen #2 was more side-story, this disc iscompletely focused, more so than usual, on the central plot. This first episode serves tointroduce most of those aspects, certainly more than we previously knew about the quest. Among other important things, we learn why the Sword of Baltanders is so important toOrphen's quest. Apparently, it has the power to turn humans and animals into horrible,exaggerated, demon versions of themselves, and indeed this is what struck down Azalie the mage. More of this story is revealed in the disc's second episode (entitledAzalie), which is almost entirely a flashback to what happened between Orphen andAzalie after initially finding the Sword together. It's kind of odd, in my opinion, that theseries waited this long to get into the meat of the backstory, but better late than never, Iguess. While much time is spent on telling this sad story of the past, the disc ends on amore grim note, with Orphen being pursued by two foes. For their own sinister reasons, Volcan and Dortin (Orphen's "servants" who always try toget back at him) decide to try and activate an ancient golem and send it to destroy him. Atthe same time, though, an old sorceress friend of Orphen's, known as Stephanie, hasunintentionally released a similar golem against him, all connecting back to events thatoccurred years previous, when Orphen was but an apprentice of the Tower of Fangs. Unlike #2, this is more serious and more oriented around Orphen's quests to notonly find and help Azalie, but also finally rid the world of the Sword of Baltanders. Unfortunately, some of the flaws I felt weakened Orphen back on disc 1 reappear here. These episodes simply rely on too many flashbacks and lengthy exposition to get theirpoint across. The adventurous attitude of disc 2 gives way to a more dull and bland senseof constantly having to stop the action to explain important, often complex, storyelements. It wants badly to be a dark fantasy, but does so at the expense of being realentertainment. Majic and Cleao are pushed into the background, functioning as onlycharacters to whom Orphen can explain things to. Considering this was intended as atelevision series, this would mean people would be spending each week watching,essentially, not much progression. 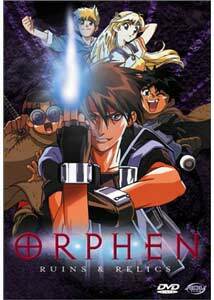 The lack of overall action makes it a long transitionfrom disc to disc; Orphen isn't bad, just repetitive. Image Transfer Review: While the image can be a tad bit grainy, there are really no complaints with the transfer. The animation is a little crude at times (the backgrounds seem a bit grungy), but it neverhas any negative effects like shimmer or pixelization. The episodes on this disc areextremely dark, so the slightly grey black level is more emphasized, but it does not detractfrom viewing. The source is clean and the compression is crisp; nothing gets in the way. Audio Transfer Review: The Japanese and English 2.0 soundtracks are good, but not particularly active ormind-blowing. Everything is mixed and balanced well, and the musical score is nicelydone into stereo effect, but there are no surround channel events, and since these episodesare largely dramatic, there is little action. As with previous discs, the English dub, thoughgenerally serviceable, makes large changes in the attitude and story-related aspects of thedialogue. It often inserts modern day colloquialisms, as well as things that the charactersshouldn't or wouldn't be saying. The characters lose much of their dignity in thisdub. Textless opening and closing animations. Extras Review: The textless opening and closing animations offer an interesting look at those pieces, andthere is a production sketch gallery. The gallery is very similar to previousOrphen disc galleries and runs at about 2 minutes. There are a batch of ADVpreviews for other DVDs, and that about wraps up the disc. Orphen is good and can be great, but at times like this, it moves painfully slow,revisiting territory over and over again. There needs to be more adventure and moreinteraction between all the characters. The heavy story-oriented slant here, though, makesit a "must see" to continue the saga over to the next volume.